“my mum will also be coming over from Abuja on Sunday. She’s very concerned about my health and wants to take me along when going back on Tuesday. But i told her that i will first discuss the issue with you” she added seriously while i shrugged. “yea you can go with her. She’s your mum. Anything that will make you get me a child is acceptable” i answered with a smile, even though my mind was still on how to tackle her friend who was probably visiting on Sunday to snitch on me. “why are you talking like this?. It’s not as if i’m carelessly losing my pregnancy” i instantly heard her sob painfully, gaining my full attention with the appalling words that came out from her mouth. “my love what did i say wrongly?” i asked with concern, holding her softly. “no it doesn’t matter. Don’t mind me” she replied and quickly cleaned her wet eyes like a spoilt child. I breathed deeply and swallowed hard. “dearest i’m so sorry, maybe you misinterpreted my words or something. I’m not blaming you for losing anything. Your mum wants the best for you so does everyone. Moreover She’s very experienced in child bearing issues and i have to agree that going with her will go a long way to help us. Fine if you want, I’ll also pack my things and go with you” i added a bit seriously. She smiled and hugged me. “i always get very emotional and upset when such topic is brought up. I’m so sorry” she apologized softly while i gently caressed her back. Of course she was very right. I couldn’t help but notice how fragile and emotional she had suddenly become. She easily read negative meaning in harmless words, which invariably had me thinking twice before making a single sentence in her presence. Seriously being married and staying married are two distance relatives. “i have to go to my room now. I can’t afford having burnt meal” i joked, kissed her forehead and headed to my room to think more on my situation with Mrs Nnamdi and Comfort. I finally had no choice than to cancel the senator’s wedding Anniversary i was invited to, because it was holding on the same Sunday my wife’s friend was coming over with her family. Yea after much thinking, i decided not to confront the woman nor try to put any more silly ideas into her head by trying to talk to her. I easily could come up with a harmless lie if she as much as breathed her discovery to my wife. Nevertheless i knew a very nervous Sunday awaited me. Saturday slowly approached without much eventful moments. We simply had a quiet day preparing for our guests ahead of Sunday, and later in the night had one of the best s-x ever. We took time to devour each other as if we were having a second honeymoon. I pounded my lovely wife with all my strength, s----d her bosoms until my mouth dried up and kissed her all over like a darling queen she was. We really were aiming to score another goal that night and i really enjoyed every moment of it especially when she gave me a special treat of serving me with a reverse cowboy position. I was taken to high heavens as she rode me to hell while i grabbed her sumptuous a-s and nodded like Lizard as she jumped up and down on me. “oh my love i badly need a child” she breathed. 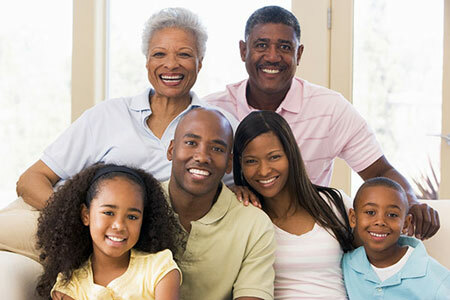 Sunday finally arrived with Nnamdi’s family coming over for lunch. My wife was overly happy and delighted with their presence while i hid my fear with a calm smile which never left my face all through that Sunday afternoon. Of course the two ladies had a lot to gossip, while Mr Nnamdi and i contributed little to their discussion. My heart was so heavy with worry and fear, freezing each moment Mrs Nnamdi opened her mouth to start a new topic. Fortunately nobody noticed my tensed up mood, nor did the woman mention anything concerning her discovery to my wife. She didn’t even tell her that she ran into me a couple of days back, and i really for very grateful for that. I seriously never knew she could be so matured as to skip such dangerous information, something i knew even men will find hard to keep from their friend. Yea supposing i was the person that ran into Mrs Nnamdi in such a compromising situation, i really would find it hard keeping it to myself. However as they got ready to leave two hours later. Nnamdi dragged me to a quiet section of my house. The look on his face instantly grew serious as he stared at me. “my wife told me something, i found hard to believe. Is it true she saw at a restaurant having a romantic time with another woman?” he asked seriously. I swallowed hard, unable to figure out a good reply. “i understand how tough it is marrying very early in life. But that shouldn’t be the reason for you to go astray. You have a wonderful woman by your side. Her family is very rich and influential just like yours. Don’t ruin your kids future. As a married man you now have responsibilities and commitments. Anyway the best advice is the one you can give yourself. Don’t hurt your wife” he summarized and tapped my shoulder, while i stared at him speechlessly. “my wife won’t breathe any word about it to your wife, because i told her not to. But please let her silence be worth it” he concluded seriously. “thank you bro” was all i was finally able to mutter, and it was the only word I was able to say to him for such a huge favour of stopping his wife from bringing up the topic before my wife. I couldn’t help but imagine my wife’s reaction supposing the news got to her. Luckily it never happened and our visitors soon left carrying the heavy secret with them.